What's the beef with frozen meat? What’s the beef with frozen meat? Most dilettante foodies I know probably regard frozen beef as an acceptable substitute only when fresh is unavailable. Sure the fresh must be grass-fed, dry-aged, properly hung and all that – but mostly it must be fresh, not frozen. However, unless your climate is wonderfully mild, that grass-fed beef is going to be eating something else over the winter, and that’s not great for the meat. Ari LeVaux, a syndicated food writer, reckons that except at the end of the growing season, when the animals have just finished feasting on lush pastures, well-frozen good beef is a far better option than fresh. When we spoke last week, I started by asking Ari why most people – foodies included – have such a poor opinion of frozen beef? In fact, I’d say there is a general misconception about “freshness”. There was a rage for fresh pasta in England a while ago. And to me it was unfathomable. Good dried pasta is so superior to the slimy industrial stuff that it is almost another food. Sure, fresh often is good. But with foods that can be preserved in other ways, and have been, a good product properly prepared is often superior. As for the nutritional composition of grass-fed versus conventional beef, there clearly is a difference. A mega-review by the Union of Concerned Scientists found that milk and meat from grass-fed animals has lower total fat than conventional, but the fat is higher in what might loosely be termed “good” fats, things like omega–3 fats and conjugated linoleic acid. On the other hand, the evidence for health benefits is more mixed. Some studies on animals and people have shown benefits, but they are by no means absolutely conclusive. So on its own, better nutrition is perhaps not enough reason to seek out grass-fed beef. On the other hand, if omega–3 fats are what you really want, you can do much better eating oily fish. But hey! It can’t hurt, and eating great beef less often is a win in so many other areas. The problem with fresh beef, by Ari LeVaux, prompted this podcast. The Union of Concerned Scientists’ review is Greener pastures: How grass fed beef and milk contribute to healthy eating by Kate Clancy. More recent research work, for example A review of fatty acid profiles and antioxidant content in grass-fed and grain-fed beef says much the same, adding that because feedlot cattle have more total fat, in the end the difference may not be as great because the conventional-beef consumer eats more total fat. I drove through the Wind River Reservation, many years ago, and it is the most beautiful place. The rise and fall of the deal between Arapaho Ranch and Whole Foods is an intriguing story that demonstrates beautifully just how complex food systems can be. Outro music is, obviously, Get along little dogies, by Marty Robbins. But for a real blast from the past, you must see Arlo Guthrie do it for the Muppets. 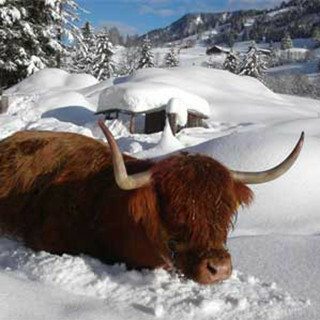 Photo from Highland Cattle World. Podcast “cover” photo (used so far without permission, but I have asked) by Esther Perez. A stunningly interesting episode. After listening to this I’m assuredly going to have to look around online for a proper purveyor of frozen beef. I’ve read several of the studies on the general health benefits of grass fed beef over corn fed, which it terrifically unnatural in the first place. I find it interesting that the economics of the situation don’t help to better drive this process in the market. While the podcast mentions companies like Whole Foods attempting to educate their customers, I certainly haven’t come across this idea previously, and I typically go out of my way to consume this type of information. The tough part of the process is determining when the product was frozen, as I’m sure many processors may just as readily freeze their excess winter slaughter. I checked in a local high end grocery store today and found a few types of frozen grass fed beef, including one from New Zealand, but the packaging didn’t indicate when it was frozen or even by whom in the process. There was only an obscure future date which I could only take to be either a “sell by” or “consume by” date as it wasn’t otherwise marked. If purveyors want to improve their position in the market, providing this type of data would be helpful, though I suspect it’s more in their interest not to indicate anything at all unless bulk purchasers and distributors like Whole Foods pressure them to do so. Perhaps the majority of the demand in the market (and specialty pricing) stops at the words “grass fed”? Funny that maize-fed can now be considered “conventional beef”. True. I suppose in this sense conventional means how the majority do it, or some such. Rachel Laudan liked this on twitter.com. Good beef frozen is better than bad beef fresh.